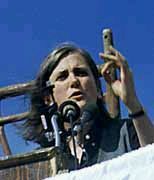 [Editor's Note: To the casual listener, Amy Goodman sounds good on her program Democracy Now! which I hear locally on Pacifica radio out of Los Angeles. She comes across as someone who's anxious to expose all of the horrors of the Bush administration, especially when it comes to the invasion of Iraq and its aftermath. All well and good, but there are a number of stories that she doesn't cover and of greater importance, she seems to be carrying the party line on certain topics like 'Peak Oil' (she co-authored a book with her brother which supports the Michael Ruppert disinfo camp on Peak Oil (E.g., the world is rapidly run out of oil) and her unwillingness to face up to the undeniable physics of 9-11. You might be interested to know that her program, Democracy Now!, is funded by the Rockefeller Foundation. Coincidence? Another funding source to be converned about is The Ford Foundation, a cover operation for CIA sponsored projects-including disinformation.